That night Amarualik came over to visit and while drinking tea, they had a great big laugh about what happened that day. All they wanted to do was to use the pellets for qamutiik(sleigh) cross bars. The thing was, nothing was going to happen to the two men or the two of us boys. They were also not going to re-use the burned out light bulbs. Zach Kunuk: Perhaps, you could tell a story about where you were born. Peter Irniq: Yes, I was born in Naujaarjuat(A place of plentiful seagulls fledgelings) Lyon Inlet. My parents are known around here in the Amittuq, particularly by Elders. My father’s name was Angutitaq and my mother’s name was Katak. My sister’s name was Iguttaq. My older brother’s name was Ipuittuq Ivaluqut. Prior to my birth, they used to live around here. They lived here, perhaps from around 1940 to about 1946. At that particular period of time, they traveled by dog team from Gjoa Haven’s Utkuhiksalik(Back River) to Naujaat’s Ukkusiksalik(Repulse Bay’s Wager Bay). They lived there for a time, then they traveled this way through Naujaat-Repulse Bay, Sanirajak(Hall Beach) and then to Iglulik. They traveled all the way here, by dog team only. They used to talk a lot about people from this Region. When I became an adult, I got to meet the people they met and I used to say to myself, “oh those are the people, that my parents used to talk about”. Over there, we never lived really in the community of Naujaat – the Settlement, as we were true Inuit, living off the land traditionally. We were true Inuit, with truly living the Inuit traditional ways. 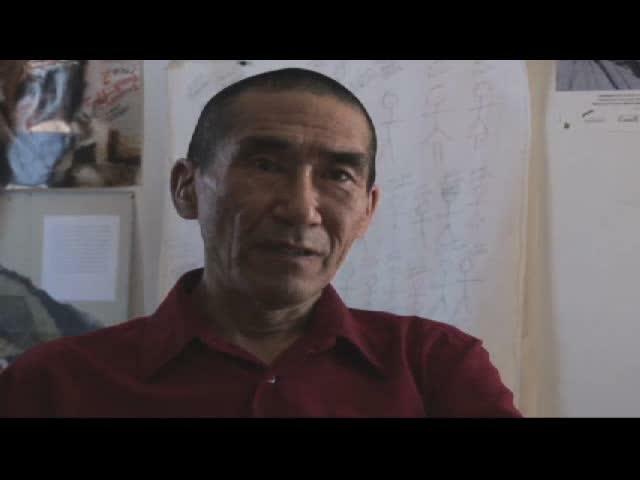 For example, for those watching us, we lived much like the ones that Isuma Produced sometime ago, Nunavut Series. The ones you guys made. At these scenes in the spring time, that is exactly how we used to live. We used to look for eggs, when there were eggs. And also, we hunt young mature seals, called Nattiat in the spring time as well. We went fishing, when it was time to fish. My father fished with kakivaak(fish leisters), that is how, he used to catch fish. He used to do this on the rivers and on the lake ice. 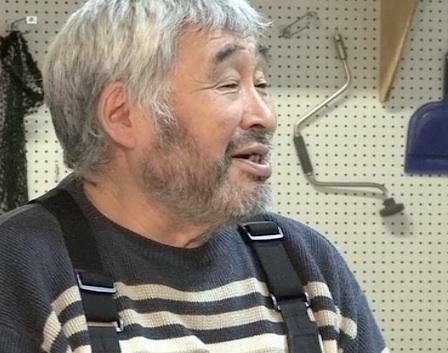 He used iqaluujaq(fish inviter without a hook). As you pull the iqaluujaq up and down, just like jigging for fish, the fish would come, and my father would spear the fish down below, with his kakivaak. He used to catch a lot of fish, along with my brother-in-law at that time. I grew up in a place called Nattiligaarjuk(a lake that has seals) Committee Bay. We used to fish there and we also used to fish at saputit(fish dam) built across the rivers to trap the fish, from going up stream. We fished just like in the films that you made. I used to participate in fishing, when I was just a little boy. When I started to learn how to fish at saputit, it was always hard to get some kakivaak material, such as muskox horns. That is what the kakivaak were made of. So, instead of using the precious kakivaak that the adults were using, my father used to make me kakivaak out of old fox traps. He fashioned them just like the real thing. We had no muskox around Naujaat either, so it was hard to get the real stuff to make the kakivaak. There is still not much muskox, perhaps you see one in the long run. Up there, when we would fish at saputit in the mornings and in the evenings, there would be lots and lots of fish(Arctic Char). We would be spearing all the fish. I was a young boy at that time around 1952 or 53. When I was fishing inside the saputit, the water used to go up to my chest, so I was pretty small, fishing with my father and my brother in law. When my father and my brother-in-law were wading in the saputit, the water was just up to their knees. I guess, I was pretty small then. When I would spear a fish, I would pull the wooden handle of the leisters, towards my mother, who was on the dry land, then she would pull the fish on to the dry land. That was how I used to catch fish. I remember when we were fishing one evening. It was so much fun and it was so wonderful! I remember being hit by a big fish, right behind my knee or at the back of my knee. That hurt really, really bad. When the fishing was finished that evening, my mother and I decided to look at my leg, I had a really big bruse(sp). Ouch!! It was painful! The reason for this was that the fish were swimming very fast all over, inside the saputit. I also remember another story. It was a beautiful day and when we looked at the saputit from our tent, the fish were almost jumping up above the water. There were so much fish! I remember it was a beautiful day, sunny and hot. As a rule, my mother woke me up very early, so that we could all go fishing. When everyone else had left to the saputit to fish, I stayed behind. I was thinking that I didn’t wanted to leave the nice warm bed inside the tent, after all, I was a young child. I was going to go along with everyone but I decided not to go, as I really wanted to stay in bed. The bed was too cozy to leave! After the fishing was done, everyone had came back to the tent. My mother was extremely angry with me. She was trying to teach me how to fish at saputit, and teach me how to fish. She then, spanked me quite a few times on my bum. That hurt very much. Every since then, I learned my lesson and tried to be obedient as I did not wanted to be spanked again. We Inuit, when we were spanked once, we would learn a great deal of lesson. Spanking was one of the ways of disciplining someone, it allowed us Inuit to be listenful, that was how it used to be. The other thing was when the days would now begin to get dark in the evenings, and you could see the stars in the darken sky, and it was now obvious that the fish had stopped swimming upsteam. Now then, the little ducklings were swimming, with their mothers the sea water. My father would have an age-old knowledge, that they are now swimming in the sea, it was time to move inland to search for caribou. At this point, the caribou fur or hair was just right for making clothes, and there is now lots of tunnuq(fat) on the caribou. We would then practice our traditional methods of hunting caribou through “tagjarniq”, “nunarpangniq” in your Amitturmiut dialect, “moving inland”. We would do this on foot and walked many miles in search of caribou for survival of our family, dogs and for our clothing and winter supply of food. As a child, this walking on the land was very boring. Adults would be carrying heavy loads on their backs of our belongingss, such as tents, beddings, etc. The husky dogs on the other hand, would be carrying our other supplies as well on their backs, such as tents, kettles, food we had to survive on. When I would get tired, “kaka” me, by putting me on his back, and carry me, along with all the load that he was carrying on his back. When I was no longer tired, I would again start running back and forth, in front of family. Up where we used to live in Nattiligaarjuk(Committee Bay), we lived all of the seasons. At one point, when we were inland, walking on this big sandy area, that extended many miles. Well, as I was walking and running ahead of the others, I noticed a little black spot ahead of me on this sandy surface. I ran towards it and when I got to it, it was one side of muskox horn. It was so old that it had lichen on it. It means, it was there for quite a while. I grabbed it and then here I ran back as fast as I could towards my father, mothers and other members of my family, to show off my find. I gave it to my father. My father was ever so thankful for me, for finding such a treasure, now, he could make a kakivak out of it. At his spare time, when the days were not good for hunting, he would patiently make a kakivak(fish liester) out of it. During this particular period, which was in the fall time, my mother would sew all our caribou clothing, preparing them for winter use. On the other hand, men did cache the meat and fat for the winter supply. I truly love to eat the tunnuq(fat) and marrow. It’s amazing, how much I love to eat the caribou fat and marrow. I used to truly enjoy eating the patiq(the marrow). One time, my mother made me eat lots of patiq. I ate so much of it that, I got sick and had enough of it. Again, she was teaching me a lesson, not to eat too much of it. Since that experience, I don’t like to eat as much patiq as I used to, but still I like them, including the tunnuq. I also enjoy eating “kiksautit” and “iluit”, the caribou guts. These are the most delicious parts of the caribou. I also used to enjoy eating the eyes and ears of the caribou. These were the kinds of things I used to crave for, when I was a little boy. These were the delicacies for the little boys, like myself, when I was a little boy. To this day, whenever I go out caribou hunting on the land, I still eat the ears and eyes of the caribou. To me, that taste of a good delicacy is still there. My thought sometimes instantly returns to Inuit culture and traditions. This is how, I grew up in and around Naujaat. In the winter time, I remember my father and others used to hunt seals very traditionally through the “agluit” “seal breathing holes”. They used very traditional hunting methods in those days, using only a downed hair of a bird, as an indicator when the seal would be coming to breathe through it’s seal hole. They also used a small thin piece of metal, which was lowered to the seal hole, to know when the seal would be breathing and then, it was time to harpoon it. They could not see the seal breathing, as all the seal holes were covered with snow during this period of time, which was normally in the month of March, when the days were getting longer. As a young man, I learned the techniques and I hunted using these thousands of year old methods. That was part of my life. 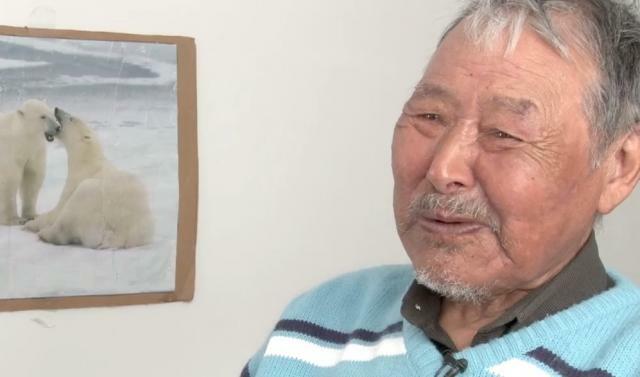 In 1961, when my father decided against me going back to a residential school in Chesterfield Inlet, this period of my time was a really awesome period for learning about my own culture. Hunting with “qiviutaq”s birds downs and savgutaujaqs(thin metal) indicator of when the seal was coming up to breathe, these are one of the many things, I learned from my father about my culture. I learned a great deal from my parents, sometimes learning about Inuit myths and legends, listening to them telling stories about these was one of the most pleasant past times. I used to ask my father to tell Inuit legends. Sometimes, he would tell a story about Kiviu, Inuit legend, who journeyed through many places. He would tell a story about Sakaliktuarjuk, a poor hunter who fooled every one in the village, that he was actually a good hunter. He would tell a story about Akturraarnaat, an evil mother, whose son was blind. My mother would tell a story about a sister and brother, who became thunder and lightening. These are the things I grew up with, as a young child. I learned about traditional pisiit(songs). My mother, father, my sister and my brother-in-law were very good sings, so I used to listen to them singing, traditional songs. I grew up to become an adult, knowing some knowledge about traditional songs of the Inuit and know how to sing some songs, to this day. I also have some knowledge about shamans. I used to watch my brother-in-law, practicing his healing of the sick. He was a shaman. My brother-in-law used his powers to heal the sick, using his angakkuuni(being shaman) techniques. My father, on the other hand, used to say, that he was not a shaman. Later on, I learned, people used to talk about him, that he was also an angakkuq. He was an extremely good hunter. He used to say, “out there” there must be something that we could see in terms of animals such as caribou. He would repeat this often, to the point where, it was repeated too often. He then, used to tell a story about spirits of angakkuit(shamans). He used to tell stories about some Inuit who had birds for spirits. Some other people had other spirits, such as wolves, and Nanurluk(a polar bear spirit). Others used to have human beings as spirits. Sometimes, they used their parents, normally deceased as their spirits, such as mothers or fathers or other relatives. My father used to tell us a story about having a ptarmigan for spirit, and how unpleasant this was, when flying. He said, this is because, they not only fly very fast but flew all over the place. It seemed like, you can hit a hill or something. He said, he used to hear this from other people. He said, other hand, having an ukpigjuaq(an owl) for a spirit, they are very easy to fly with. He said, they would fly high up in the sky and can look both ways. And they could see everything and anything down on the ground. I used to think later on that maybe he was talking about himself. Maybe, he used to fly, but we just didn’t see him fly. This was probably how, he used to know where these animals are, that are “out there”. When he finally goes over to the land, that he was talking about repeated, sure enough, there was caribou. He was like that. I grew up learning by observing all the things about Inuit cultre. In the summer time, as children, we used to go down to the beach when the tide was low, looking for Kanajuit(sea scorpions or scanvenger fish with large mouth). Sometimes, we used the go down, when pieces of broken ice were on the beach. We could start to hear the “qallupilluit”, they would be knocking again the ice or the ground. Qallupilluit are spirits, and cannot really be seen by any human being, unless you have extra ordinary powers, such as shaman. My father said, they had feathers like ducks. When we were children, like my friend, the late Simon Aglak, we used to like to go down and look for kanajuit. We used to live on the east side of Naujaat, at Kuugaarjuk, quite a bit of distance from Naujaat. When the tide was low, Simon and I used to look for kanajuit. We used Inuit Traditional Knowledge, looking for these kanajuit. Sometimes, when we would be walking close to the ice, qallupilluq(single) would begin pounding against the ice. When that happens, my mother would yell and say, “you might be gotten by a qallupilluq, come up to the land here”. When you were going to sleep at nights, as long as there was ice around, you could hear the qallupilluit pounding against the ice. When we were looking for kanajuit, my mother also used to say, when you are out there, and if you see a “nipisa”(a round-shaped black fish with sticky pad protruding from throat with which it clings on to things, or sticks to your hand, like a scotch tape). My mother would say, the only way to take it off is with an ulu(a half-moon) woman’s knife. One time, when Simon Aglak and I were looking for kanajuit, I lifted the rock to see if there were Kanajuit, and all of a sudden, I saw this fish, I grabbed a hold of it, and it got stuck on the palm of my hand. My mother carefully, took it off with her ulu. That was how, I grew up as a child, with my parents in Naujaat. Ever since I can remember, I used to hear about other Inuit from Uqsuqtuuq(Gjoa Haven) Region, Qairnirmiut(the people of Baker Lake area), Talurruaq, my father used to live within those regions. I used to hear about our fellow-Inuit in those areas. I grew up as a true Inuk, living in an iglu in the winter time. While living in an iglu, it can be old at times, especially when there was no oil on the qulliq(Inuit oil lamp). When you live on the sea coast, you used seal fat to light your qulliq. But when you are on the land, or inland, you would have a small oil lamp, that you carried with you. Since there was no seals on the land, my mother would use tunnuq(caribou fat) to light the small qulliq. She used to light the qulliq when she was going to sew our clothes in the evenings. We also used to chew the caribou fat to make candles. We used them for lights in the evenings. This is how I grew up in the Aivilik Region of Nunavut. When I was growing up, I grew up with much happiness and with wonderful things happenings. That was my cycle of life. Zack Kunuk: What is it your Inuktitut name? Peter Irniq: Taqtu Irniq, those are my Inuktitut names. My mother used to tell a story of her dream, when they lived in Maluk&ittat/Naujaarjuat or Lyon Inlet. She said, she dream’t about this Irniq. That Irniq had relatives in Naujaat as well here in Amittuq. He lived in that area around 1940 or 47. In her dream, my mother said, this Irniq wanted to be named in me. She said, her dream was almost life-like or as though she was awake. We were not related at all. This is why, I was named after that Irniq. Taqtu on the other hand, belonged to a lady relative of ours in Naujaat. When I was born, she named me after that special lady named Taqtu. When I was born and getting older, I remember calling her, “Taqtuuqatiga” “my fellow Taqtu”. This was part of Inuit culture that we practiced. To this day, whenever I talk about her, I refer to her as “Taqtuuqatiga”. This is very important aspect of Inuit culture. I only have two Inuit names. On the other hand, when I was born in 1947 and baptized by a Roman Catholic priest, I was named Pierre. Inuit called the priest Kajualuk(because his big beared was brown) so Inuit called him Kajualuk, translated to “Big Brown”. When I was going to a residential school, I became to be called as Peter, by the Qablunaat(White people). Peter Irniq: Yes, particularly, the old, old people, people who were much older than us. They were the fellow-Elders of my parents, my father. We were taught from never to call them by name. Even, if we did not have calling titles for them, we were told not to call them by their names. We respected their Elderships and their ages. It was like honoring them. As children, we were told not to call the older people, those who were older than us, by names. Some we had calling titles for them, and even when they were not related to us for example, we would call them, “my avvakuluk” “my dear little same name”. “My uncle over there”. We had different calling titles for them. “My same-age or equal-age person”. When people were named after certain individuals, we naturally had calling for each other. We were taught to respect and honor. When an Elder came into our tent, and I was sitting down, I was to stand up immediately and allow the Elder to sit down. I was told, do this, without being told. Zack Kunuk: When was it that you were sent off to school? 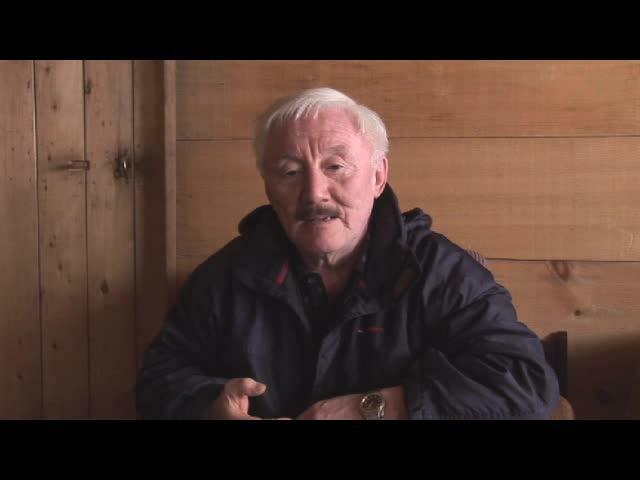 Peter Irniq: Some Naujaarmiut(people from Naujaat) were sent off to school around 1953, 54 and 55. In those days, they were being sent to school in Igluligaarjuk(Chesterfield Inlet). As for me, I knew I was never going to school. I knew this because, I grew up as a true Inummarik, and knew that I would live an adult life as a true Inuk, a hunter, fisher, and trapper. Ones that are older than I am, they started going to school around 1954-55-57 to Chesterfield Inlet. It was around that time. For me, going to school was something that I was not prepared for as we never lived in a community with other people. My father used to say that living in a community, all you get is welfare from the Qablunaat. He didn’t want to be like that. He always wanted to be close to animals for food and clothing. We lived in Naujaat, I think, only two times, once in 1956 and another time in 1957. At that time, my fellow-youth, were being sent off to a residential school. As for me personally, we living in Tinujjivik(a favorite fishing spot of the Inuit in the spring time, when the fish were swimming down stream). We living there in the summer time and it was in the month of August. It was a time of year when the days were really beautiful, sunny and hot. Tinujjivik is not visible from Naujaat, but if you live in Naujaat, you could see in the distance, the outpost of Tinujjivik. It is around 13 miles west of Naujaat. Tinujjivik is a place for fishing. In the spring time, people would build saputit and when the tide is low, the Arctic Char would be trapped inside the saputit, and that was how we used to fish at Tinujjivik. We would move there in the spring time and moved a short distance to the east, where there are more seals in the area. Well, that summer of 1958, we could see a boat coming, with an engine. We could see it very clearly, as it was a very beautiful day. As our custom goes, my mother started to make tea by burning heathers, as this was a summer time. We only used heather and other moss to boil tea in those days. It was such a wonderful feeling that we are having some visitors, so she decided to make tea to welcome the visitors. Then they beached the boat. As they beached, we walked down to the beach to greet the visitors, and all of us, walked down behind my father. But that father, a priest, the late Father Dedier, came off the boat, first. 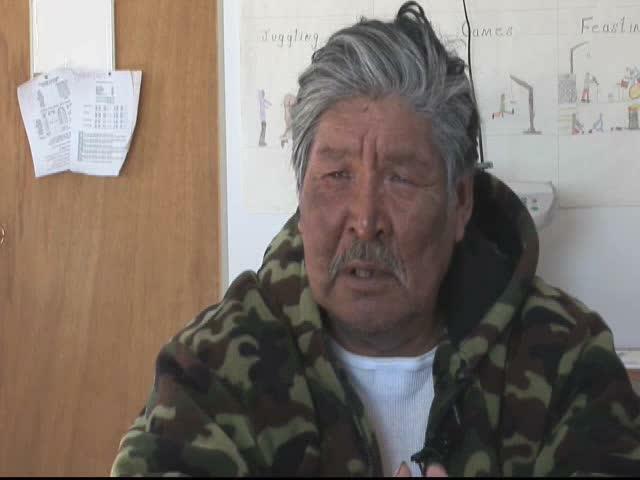 He came off the boat, and said to my father, “Peter Irniq is going to school in Igluligaarjuk so we came to pick him up”. He didn’t even greet my father by shaking hands! I have never seen my father panicked but at that point, he was panicky. So he ordered me by saying, “they came to get you, go put on some nicer clothes”. My mother and I quickly went back to our tent and she made me put on niururiak, a seal skin boots, with the fur outside. I got all dressed up in my best, and off we went to Naujaat. The visitors didn’t have tea. As Inuit, they would have stopped to have tea, if they were regular visitors, then leave after they had tea. I don’t have any idea why this happened the way it did. I wondered, if the priest had told them earlier that, before anything happens, we should leave immediately. I don’t know. When we were traveling towards Naujaat, my goodness, it was lonely. It was the loneliest time of my life! It was too awesome! Zack Kunuk: You then, left your parents? It comes back instantly! My parents, my sister and brother-in-law, and my little brother, who died in later years, my niece, I watched them, as we are traveling farther and farther away from them. They were all standing by the shore, seeing me off, until I was no longer visible by eye. Wow! Perhaps, it’s that particular incident, when I was suddenly taken away, it’s been long time ago, since 1958, to me, it comes back quite suddenly, to the time I was a child. That very part, it is very difficult to become adult with. You stayed a child forever! Even though, I am a old person now, but sometimes, you have to returned to it, or re-visit it, instantly. And so, we were on our way to Naujaat. Zack Kunuk: How old were you at that time? Peter Irniq: Eleven. Yes, I was 11 years old, when I was taken away. So, we were traveling towards Naujaat. I watched my parents, as they were no longer visible by eye sight. They were still standing on the beach. They were also watching until we were no longer visible in the horizon. When we finally got to Naujaat, I was made to go to Angutinguaq family. 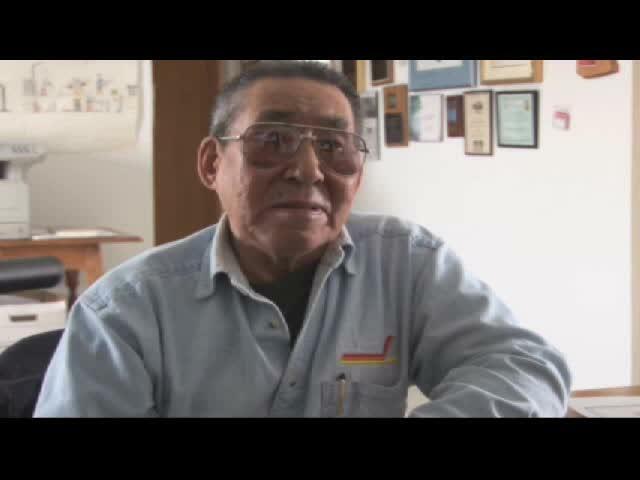 My father and Angutinguaq were cousins. So I was to stay with this family, according to the wishes of the Roman Catholic Church. They were the adoptive parents of Jack Anawak. We had been here for some days, I guess my parents would watch from where they were, to see if the plane had come and coming to land in the water in Naujaat. Even though, Naujaat was some distance away, they could see airplanes from where they were. Since, they did not see any planes landing in Naujaat, a few days later, my father and my brother-in-law, came over by canoe with an outboard motor. When they arrived, it was so wonderful! Since they arrived, I became relaxed, knowing that I now have a foundation here in Naujaat. At that point, Angutinguaq, who I called Haluuruluk. Since they were in the south in 1925, spokes some English, I was to call him, my Haluuruluk(my darn Hello). Now that my father and my brother-in-law here, I had a foundation and practically no more worries and stress. At that point, Father Dedier had said, the plane would be here to pick us up, after three or four days, to bring us to Igluligaarjuk. He said, we were free to do whatever we wanted to do. Now that we are free to do whatever we wanted to do, and there was lots of broken ice in Naujaat at this point. My Haluuruluk had a boat called Uvajuk, it was very tippy so it was called that name. Using Uvajuk, we would go down to the sea, in between the ice, to see if there might have been bearded seals or walruses. We were doing this, while we were waiting for a plane. Once we were out there, they got me to steer the boat, while my father, Haluuruluk and my brother-in-law were on the look out for the animals, maybe polar bears. We waited may be about four days, a single engine plane came to pick us up. And so, we board the plane, and we were now on our way to Igluligaarjuk. It was my first time in an airplane. I remember my father having a discussion with another Inuksuk, when I was much younger child. This man was on an airplane previously. My father had asked him, when the plane was taking off, do you watch the ground? We used to get very few planes in Naujaat in those days. So, this man was telling about an airplane ride he had. He said, when they were taking off, and he was looking down on the ground, he could see that as they were going so fast, he could see stripes of blue, green or red or yellow. Remembering that story, I was looking down on the water as we were taking off. As you know it was my first time on an airplane. I kept on a lookout for green, red or yellow stripes. There was nothing. It was actually a slow airplane. Perhaps, he was exaduating(sp), to make the story more interesting. And when we were going back home, we were taking off from the snow, it certainly was not like that, there were no beautiful stripes. There were about 10 or 12 of us, who were brought from Naujaat to Igluligaarjuk. We traveled to Chesterfield Inlet for about two-and-a-half hours. Zach: With a single engine airplane? Peter Irniq: Yes, with a single engine airplane. This airplane belonged to the RCMP, the one they used to bring us over. On the side of the airplane was a yellow stripe, with a dark blue paint. The tail of the plane had a yellow paint as well. Zach Kunuk: When you are getting close to Igluligaarjuk and the time you were landing to Chesterfield Inlet, can you tell us about that? Peter Irniq: I remember this very well! I don’t forget things at all, so I remember it very well. I am an Inuk. I grew up as a real Inuk, at that time. My mother and father, always used to tell me to be looking or observing…always. If you see something, then you will be able to tell me. Look for animals. I used to look around for anything, at that time. When we left Naujaat, it was a beautiful day. We arrived to Igluligaarjuk, it was even more beautiful. Hot! There were some clouds. There were beautiful clouds, with the sun shining. When we got closer, the sea water didn’t seem to be as beautiful. But the land, was beautiful, much like Naujaat environment. The stone formations were beautifully bright! I could see all those each time I look down below me, from an airplane. They very much resembled, Naujaat rock formations. Naujaat has those. When we were getting closer to landing, the land and sea were both beautifully pleasant. That time, we landed at Tasiraaluk(a small big pond). Tasiraaluk belonged to Iguligaarjuk, it was situation just around the houses. We landed there at Tasiraaluk, a fairly big pond. The airplanes landed so it was quite a large pond. The Roman Catholic Church used it for water supply. We beached on a beautiful rocky beach with the plane. When we beached, we all got off. I saw some Inuit there but then, I saw the Sisters, the Grey Nuns, for the first time in my life. They wore long dresses, and their hoods had little “furs”, but with lots of little holes, just like window screens. Some of the nuns were extremely beautiful! When I first started seeing Qablunaat, they were always beautiful. To see the Grey Nuns, they were even more beautiful than the Qablunaat, that I had seen previously, which weren’t many. I started to see the Qablunaat there, some belonged to the Department of Transport and others were priests. I used to think, I wonder if White People had ugly people. They all seemed to beautiful and handsome. The Grey Nuns that I noticed so much being different than most people, were to be our care takers, supervisors. They came to meet us. So, I was standing there, as I didn’t know where to go, nor have any place to go. My fellow Naujaarmiut were there, Paul Maniittuq, John Ninngak Mike Kusugaq, and Katherine and the late Francios Nanuraq. There was also Nick Amautinnuaq and Jose Kusugaq, who we knew only as Amaujaq in Naujaat. 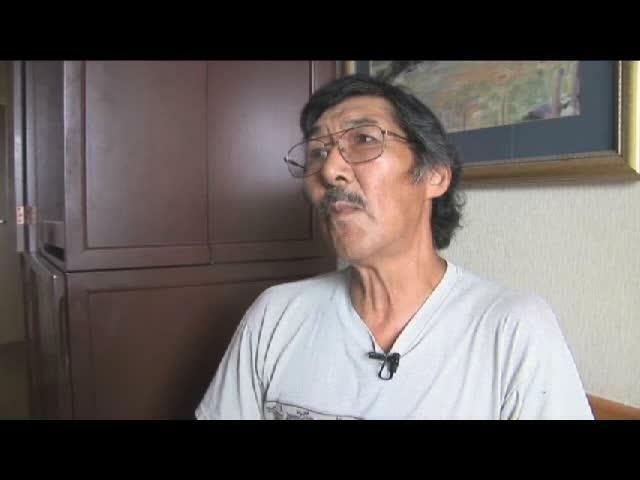 When our names were changed by the Government of the Northwest Territories, he became Jose Kusugaq. He was along with us. There was also Agatha from Naujaat. There were others, Maria, Theresie, now Theresie Tungilik. She has his father’s name today. Those are the ones who came here to Igluligaarjuk. There was this little Qablunaaq, he was slightly bigger than I am. As I was 11 years old, I was not that tall. I maybe, was about this height. As he was standing next to me, and kept looking at me and then asked me: “What is your name?” with a French accent. I understood what he said, as the year before in 1957, we were taught some English by the Roman Catholic priest, perhaps for a week or so. We were taught in English about things that were inside the Roman Catholic Mission in Naujaat. “Box” “Seal” “House” so we learned a little bit in English, then. “Fish” I used to tell my father about what we had learned. He used to recognize the words that I told him about. The four of them, including my Haluuruluk Angutinguaq, Tapatai and Savikataaq were in the land of the Qablunaat in 1925. They were in Newfoundland, Halifax and in Montreal. When they returned, they learned some English and were able to speak some English. So what I was learning, he would recognize them once I tell him about them. We were taught by Iksirajuakuluulaurtuq(Formerly Father Franzen), and Father Dedier. So, when he asked, “what is your name”, I understood him. As I answered him, I was extremely timid and said, Peter. Also, I was feeling very strange to see the Inuit of Igluligaarjuk. Everything was too awesome for me! From there, we were led by a Sister to the hostel. I walked along with my good friend Paul Maniittuq. Both of us walked in behind a Sister, as we were told to follow her. We were apparently going to the big house, the Turquetil Hall. It was a huge building, green in color. I turned to one side and noticed another big building. These buildings looked really big. I also noticed the Church Rectory, it was beautifully built. When I looked to the west, there was a Statue of Virgin Mary, surround by rocks, it was beautiful. From there, we saw another large building, two-storey, this was a hospital as well as being a home for the Nuns. This one was not to be our home, at that point. The one, we were going to was a two-storey hostel, it was to be our home for entire winter or during all the time, that we were going to be in Igluligaarjuk. We called it Iglurjuaraaluk – a real big hosue. When we got there, we were told to take our clothes off. We were to have a bath. We were deliced. We got our haircuts. We got our haircuts with those old fashioned manual hair cutters. I had a very short hair. In fact, all of us young boys had very short hair at that point. I also noticed that day that the young girls also got a hair cut, by cutting their hair, right across their forehead. They looked so different. It was the firs time I ever saw a bath tub, as we didn’t have bath tubs in Naujaat. It was the first time I ever saw and worn shoes. I put a short sleeve shirt for the first time. That was the first time, I ever put on a foreign clothing like that. Wow, it was so awesome! There were lots of boys and girls, Iglulingmiut, Qamanittuarmiut(Baker Lake) kids, Arviarmiut(Arviat kids), there were many of them. That day was something to remember, that very day in Igluligaarjuk. Then when the night time came, we were told to go into our large, huge bedroom. There were many beds. I was given my bed, complete with sleepers or pjamas. I didn’t know a darn thing about these items, as we did not use them in Naujaat. 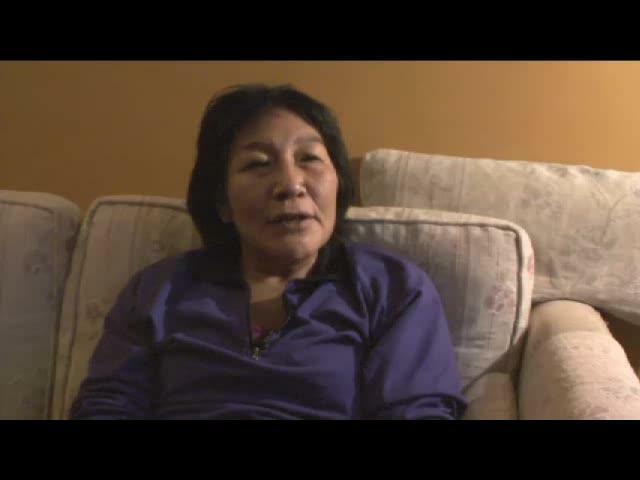 As an Inuk, I slept completely naked, at home. Just before, we went to bed, we were told “to kneel down” and pray. I guess, this was the beginning of praying. We prayed a lot. That evening was just the beginning of our praying. When we woke up the next morning, we prayed firs thing, then just before our breakfast, when we got to the school, we prayed first thing, we used to go to school at 9 in the morning. Right after we said the Lord’s Prayer, “our father who art in heaven…” then we sang, what is apparently a “Oh Canada” song, Canadian National Athem. I didn’t know what I was singing about but just trying to follow along and copied everybody. I was completely unaware of what these songs mean’t. We had our teacher, who was a Grey Nun. After that first morning of schooling, we had to pray again, just before we left for lunch. When we got into the dining room of our hostel, we prayed. Just before we left for school, we prayed again. When we got to the afternoon school, we prayed again and then sang, God Save the Queen. We stayed in school during the afternoon for about two-and-a-half hours. Then when the English classes were finished, a Roman Catholic priest came over to teach us catechasm. This activity was also very noticeable to myself, especially, during the early stages of staying there. 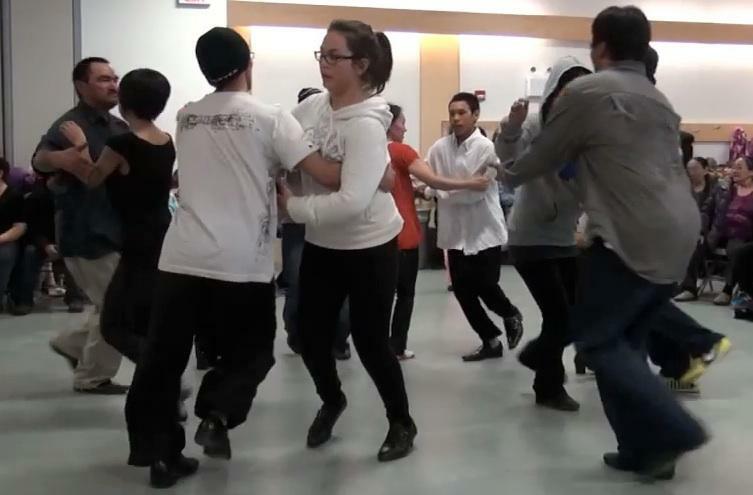 I was happy with this exercise, as we were able to speak our own Inuktitut language. Whereas at the school, we were told to speak only English. 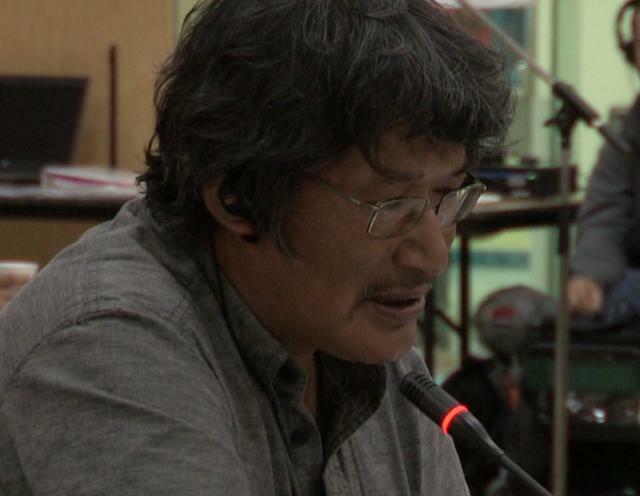 We were completely forbidden to speak our own Inuktitut language. At that time, Father Farard used to teach us catechasm. I had some idea about the Bible and the prayer, mostly I’ve learned this from my mother. This was prior to going to Igluligaarjuk. Prayer books were used quite a lot in those days, I even have one at home, one of the first prayer books of the Church. The top page has a drawing of a church, couple of iglus and Inuit. I have the old prayer book. When that priest was teaching us about the bible, I was the most knowledgeable one about it. I knew so much that I won a prize from Father Fafard. This was shortly after, we’ve been there for a short time. For my Prayer Book knowledge, he gave me a green apple for a prize. I didn’t know it was an apple. When you go outside, you can eat it, he said. So, when we got outside, I decided to take a bite out of this apple: Oh, what a horrible taste!! I found the apple so horrible tasting, so I gave it to Marius Qajuuttaq, who was walking with me up to the Turquetil Hall. I told him, I just hated the taste of it so I said, you can have it. A year ago, he has already been to that school, so he like it and found it very delicious! As for me, I ate a lot of Inuit food, such as dried meat, so I totally found dried fish very delicious. So, I gave that apple to Marius. I wonder, if he sometimes thinks about it today. Zack: Would you like some break? 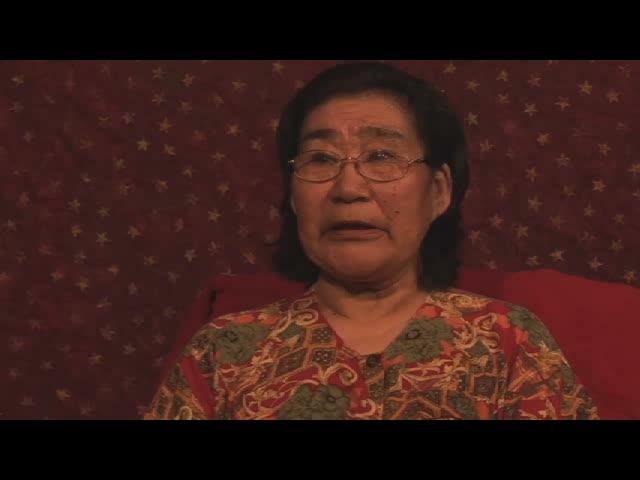 Rosemary Kuptana's residential school survivor testimony. In English. Serapio: I am very welcomel! Peter Irniq: Richard, please feel comfort. 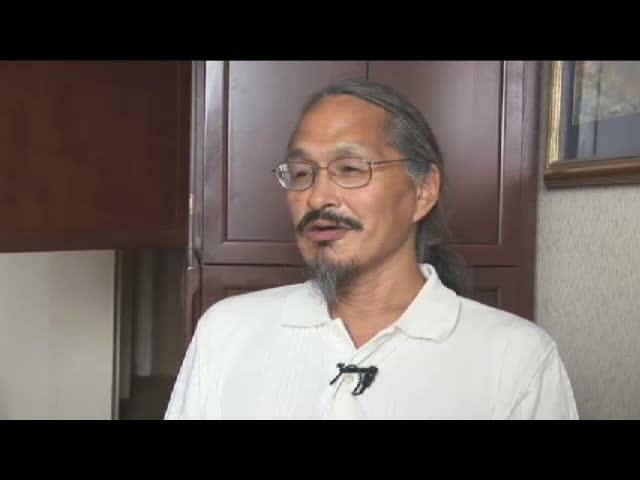 Interview with Pond Inlet Mayor, Charlie Inuarak, about the proposed Mary River Mine Early Revenue Phase project. April 2013 visit to Arctic Bay by Zacharias Kunuk and Jon Frantz.